STORY & PLATFORMER - Action + Adventure + Story: The ultimate metroidvania-style game! INNOVATIVE WORLDS - 8 huge worlds in different well designed themes! MANIFOLD ENEMIES - Over 100 different enemies and up to 30 different bosses! SECRETS - Over 100 secrets! Every secret has its own kind of puzzle! ELEMENTS - Learn up to 8 different elements. Each element will bring you three different abilites! BOSS CHALLENGES - Fight against bosses in four different modes and show your friends how it's done! TIME CHALLENGES - Play parts of the game with a time limit and beat your friend's best time! COOP-STORY - Get help by one of your friends and beat the game together! BOSS TEAM BATTLE - Hardest challenges are awaiting the best teams! DEATHMATCH - Fight against your friends in crazy arena maps! CAPTURE THE PEARL - Fight in teams to capture your enemy's pearl! KING OF THE FLAMINGO - Play in teams to capture flamingo outposts, hold them, generate points and your team will win! 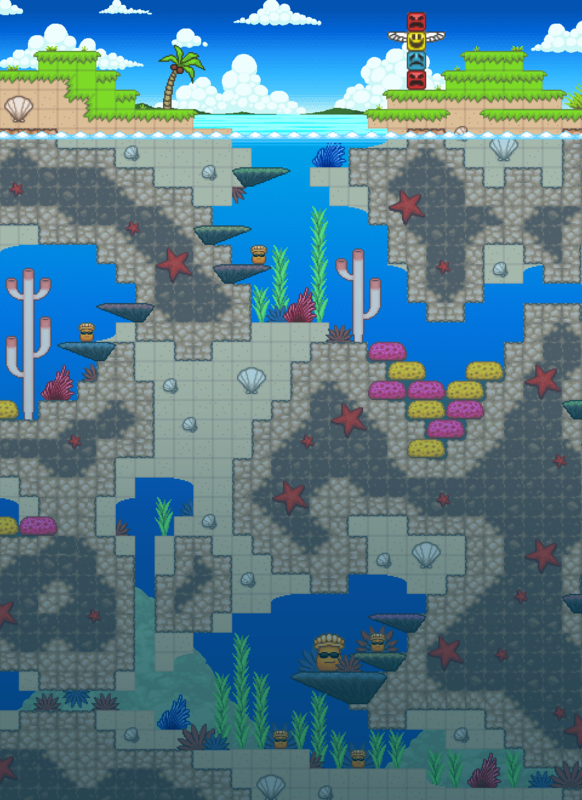 DEFEND THE HOLY MOLLUSC - Play with your friends in one team and protect the holy mollusc against huge waves of enemies! MULTI-PLATFORM - Windows, Mac OS, Linux are confirmed. We want to release the game on Wii U, PS4, XBox 360 and Ouya too, but we cannot promise this. Nintendo, Sony and Microsoft has the last word about it ;-). MULTI-LANGUAGE - Game will be released in many different languages! If you are interested feel free to like us on facebook or follow us on twitter. You can even discover more on our official page! You want to help us? Share us in all your social networks! Be prepared for a well-looking trailer! Do you want to ask or tell us something? Do it where-ever you like. Finally we released the trailer for Snot. 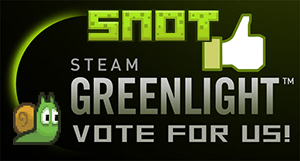 The first hours of Greenlight went well, too! But we need all the support we can get. More about the world design in Snot. With details about "World 1 - Calamari Cove". We already told something about the gameplay. But there is many more to say about the gameplay. This time more about collectables. Read about the whole story line in Snot and have a look at our intro video. Yeah, there aren't much winged shrimps out there! :) Glad you like it.